This last stretch of riding has been incredible. We are so happy that we made the decision to turn off the Panamerican Highway and try our luck on the 'Troncal Amazonas', the highway that runs along the edge of the Amazon Rainforest. We were treated excellent quiet roads, delicious fruit, wild flowers, snakes, daily torrential downpours, and many other jungle offerings. We were a little unsure what would find in terms of road conditions, and were mentally prepared for long stretches of dirt roads, but amazingly all but 10-15 km of the route was paved! It was much hillier than we had expected... I think that we had just as much climbing on this route as we would have in the mountain route, but climbing steep roads without heavy traffic is a lot easier! As usual, we are trying to cram a whole lot into one update... So hopefully this post won't be too long-winded, but there is so much to tell! 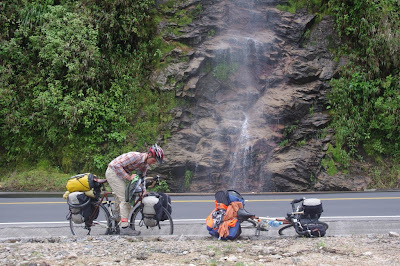 According to the Internet, this is the most famous bike route in Ecuador! Quite a reputation. Tourists can rent bikes in Banos and enjoy the mostly downhill ride to Puyo passing waterfalls along the way. For the first ten kilometres of the ride, I was beginning to think we had made a fatal mistake by leaving on a Saturday... The roads were full, not so much with cyclists but with brightly coloured tour buses and atvs. There are many tunnels along the route, but cyclists are diverted to the rough tracks that bypass the tunnels... Unfortunately the tour busses and atvs also take these tracks! Fortunately after a little while the buses and chaos petered out and we enjoyed a quiet and scenic ride... and felt that air getting hotter! When we arrived in Puyo (at around 1000 m) it felt sort of like arriving in a new country, people seemed a lot friendlier, one guy even offered to give us $10 after asking about our journey (we didn't take it!). This friendliness may, of course, have been because it was Saturday and many people seemed to be a little drunk... Either way, it was a nice welcome to the Amazon! Today was glorious! Rolling hills, smooth pavement, very little traffic...a cyclists dream come true... Especially after the heavy traffic of the Pan-Am. We meandered along enjoying the views and the kindness of the folks we met along the way. Late afternoon we reached the Rio Pastaza, and started looking for a place to stay. Options were limited to... one option - a swimming resort. They did have rooms, but these were beyond our budget, so finally the owner agreed to let us camp on the property. We also had a delicious dinner cooked by the owners wife. That evening we discovered the ferocity, and sheer volume, of the Amazon rains. We had rigged up our tarp over our tent and bikes for extra protection... But it required a lot of adjustment to make the situation somewhat dry. Luckily we were able to stay dry enough, and we resolved to find more sheltered places to camp in future Amazon nights! Today was hillier, with a long climb that lasted into the afternoon, but the views and quiet roads continued. We had a lovely gradual downhill stretch before we crossed Rio Upano, and then climbed up a couple hundred meters to the town of Macas. Macas was far bigger and more bustling than I had expected, I think that I had an image of sleepy little villages all the way along this stretch...not so, it seemed. I was in the mood to find a cheap hotel to stay so we could get a good nights sleep. Unfortunately, the desired price and cleanliness combination was not to be found in Macas, so we ended up asking the Bomberos if they might space for us, they welcomed us in and we had a whole gym space that was under construction to ourselves. It actually worked out perfectly as there was plenty of space to dry everything out for the night. We had 'Chifa' for dinner than night... This is what Chinese food it called here, it is actually an excellent ways get in a lot of veggies as we normally get a plate of noodles or rice with a big pile of cooked vegetables on top - all for $2-3 a pop... Yum! It was pouring rain when we woke up... We got up nonetheless, hoping it would settle down, fortunately it did and we headed off on more smooth pavement. Today's ride was mostly a descent, we would end up around 500 meters in the town of Mendez. We were moving pretty fast, but it was getting hotter as we descended ! We stopped to fill our water bottles at a creek...and just as we got moving again the clouds unleashed buckets of rain on us, and a few minutes later the road deteriorated into rubble! Fortunately the dirt/rock road did not last too long, but the rain did... Well into the evening it turned out. We arrived in Mendez soaked, and we very very happy to find a cheap but clean hotel with rooms on the ground floor. We decided to take the next day off to explore the town and rest up a little. It was in Mendez that we discovered google maps has placed this highway in the wrong place. This wasn't of much consequence, but we do use an application called 'geocontext' to get elevation profiles of our rides. This helps to plan out our days quite a lot, as we have a sense of when the hills are and how long they will be. Geocontext uses google maps.... So our elevation profiles were way off. So, we rode off to Limon without much of a sense of what to expect in the way of hills. There turned out to be a lot of ups and downs, so progress was a little slow. The rains came mid afternoon again and we arrived in Limon soaking. The Bomberos happily took us in again and gave us the entire unused third floor...again, perfect for drying out all of our gear. Dinner was in the covered market/sports area. Almost all towns and villages have a covered sports court, what is especially interesting is that they all seem to have basketball nets, soccer nets, and a volleyball net all set up. All games seem to be equally popular in these parts, and if you ask a kid what their favourite sport is, they will be sure to tell you soccer, basketball and volleyball! It was a restful night in Limon. It was a short, long day today. Essentially a big climb and then a big descent. The climb was the switchbacks up the switchbacks variety, so it was slow going. Took us about three hours to do ten km! On the way up a truck was moving slowly behind me and and I was wondering why it wasn't just passing ( I was only moving at 5-6 km/hour! ), I eventually passed and I saw why it was going so slowly... The driver was breast feeding! A little while later the same truck was pulled over, and I thought 'oh good, she has decided not to breast feed her child and drive'... But they were just switching so the toddler was on her lap instead! There are different standards regarding kids in cars here. We arrived in San Juan Bosco mid afternoon and discovered that the town festival was just starting that day, so people were busy sprucing up the central plaza. As we were relaxing in the plaza two women came over and gave us two bottles of Gatorade! A very friendly place we discovered. We made our way up the hill to the Bomberos station, but it was all locked up and looked somewhat abandoned. The police station next door said we could camp beside it, but the area did not look like it had much drainage at all, and we feared sleeping in a few centimetres of water... And since it rains just about everyday down here we opted to look into other options. Some kids where hanging around and they showed us to the cheaper hotel, which we had missed because it was didn't have its sign up due to renovations. Turned out to be perfect, and so that is where we rested for the night. Hard long day... Two big climbs, and some road work, but not nearly as much as we had anticipated. We were also very lucky that the rains held off, making our passage through the dirt roads a lot less muddy than they could have been. As we were hurtling down our last descent I saw Glenn stopped in the middle of the road... he was watching a Boa Constrictor crossing the road! It was big and scary, but just slowly crossed the road, aware of us, but not paying us too much attention...eek! Several km later we came to a road block. In fact they were putting a new drain pipe under the road and were in the process of covering it back up so people could drive over it. We were told that it would only take another 30 minutes or so, but we were skeptical. It was already late in the afternoon and we were unsure how much further it was before town. So we took a steep, muddy, scratchy plant trail around the road work. It was an interesting and dirty process, but we made it around without too much pain. It turned out that the town was only a few more km down the road. We were both tired, and ended up pedalling up an down far to many hills to get to the centre. I was starting to go to a very tired, not thinking straight, anxious state... So Glenn left me at a restaurant and went to search out places to stay. I proceeded to drink a very large beer and order some food, but Glenn was taking a very long time... And I was getting a little stressed, but was also feeling the effects of the beer. I began wondering how I was going to rescue him from whatever had happened to him whilst being drunk and navigating two loaded bikes through cobblestone streets. Fortunately he arrived a few minutes later. He had been talking to Memo, the owner of a bike shop in town and he had also checked out many hotels. We had another beer...actually two because the waitress had not quite heard me correctly... A little later Memo came by and offered us a place to stay at his house, we gratefully accepted and were given his oldest sons room. Unfortunately a fiesta was also on in this town! So loud music penetrated the house well past midnight! Everyone in the house woke up late, actually I think everyone in the town woke up late after all the partying. Memo made us breakfast of two ham sandwiches and a glass of yogurt. Since we don't eat meat, we just had the bread and yogurt! Fortunately breakfast improved when Memo scrounged up a plate of fruit for us and we were able to make some coffee. We thanked the family and we were on our way around 11 am. The first stretch went very fast, only rolling hills to contend with. Then we hit a big climb which slowed progress a tad. Around 4:00 pm we reached the town of Los Encuentros where there were two hotels, both were closed, but folks said that the owner of one of them should be coming back soon. With only a couple more hours of sunlight left we decided not to chance it and push on to the much bigger town of Yantzaza, for a while it seemed like we were cycling into the eye of a storm as rain and strong winds seemed to be telling us to 'go back to Los Encuentros!'. But the weather cheared as quickly and unpredictably as it had come, and we made it to Yantzaza where we found many hotels and places to eat. It was a quiet night...and we went to bed early to make up for the night before! Zamora would be our last town on this Amazon stretch, we were thinking about taking a day off to rest up before climbing back up to the Andes... But when we arrived into town we, again, had trouble finding the desirable cleanliness - price combo... And spent far too long searching for a place. Finally we found a very nice place just outside of town... That night we had Chifa again, yum! The next morning I had decided I needed a day off before the climb up. We also wanted to do a bit of research on the road conditions. We had heard that there had recently been a number of slides on the road to Loja and that the road was intermittently closed. Unfortunately there was not wifi access at our hotel, so not too much was accomplished in that respect, but asking around we discovered that the road was essentially open, it just closed at certain sections for several hours a day so that they workers could clear up the mess from the slides. It ended up being a lazy day for me, I was started to feel hints of getting a cold or flu... So I stayed in and read and took some homeopathic medicine, while Glenn pedalled a short distance to the the Podocarpus National Park to explore the trails. I was regretted not going when he got back... But my body seemed to need a rest...Good to listen to the body. We actually took two days to do this ride. We had about 46 km of climbing, and 1900 meters of vertical gain, so the going was slow. Also got a late start out of Zamora because of heavy rains. So, when we arrived in the little town of El Tambo around 1:30 pm on the first day, aware that we had another 20 km of climbing... We realized that it was probably not feasible to make it in a day. We asked around and were offered a place to sleep at the community centre, it was a quiet and restful afternoon and evening...and it was early to bed! We took off the next morning around 9:00 am and the town police officer told us that the slide site which was 10 km ahead would only be opened from 12:00 - 1:00 pm. We took off not knowing how long the 10 km might take us, turned out it took about two hours and we waited an hour at the site. It was pretty impressive, huge amounts of dirt being cleared and pushed off the edge of the cliff... A little scary too! The area opened at almost exactly 12:00 pm and we made it through... Glenn biking, me running and pushing my bike...being cheered on by the workers! We had another 10 km of steep twisty climbing before reaching the pass. To begin with it was a little stressful because all of the cars, trucks and busses were zooming past us on hairpin curves...but after they closed the slide site again, we had the road to ourselves. As we reached the pass it was cold and rainy and we put the layers on. It was quite a stunning pass, as one side you could see miles and miles of wilderness and the other you could see the expanse of Loja. It was a delightful descent into town and we found a cheap hotel near the centre. Here we will take a day or two off to update the site (now done! ), and decide on our onward route. We only have about 150-200 km left before reaching Peru, hard to believe !